Austrian guitarist Wolfgang Muthspiel makes his ECM leader debut with Driftwood, a trio album of subtlety and depth featuring renowned US jazz players Larry Grenadier and Brian Blade. Muthspiel – who recently made his first ECM appearance on Travel Guide as a member of a cooperative trio with fellow guitarists Ralph Towner and Slava Grigoryan – has enjoyed long, productive musical friendships live and on record with both Grenadier and Blade, leading to a sense of telepathic interplay on Driftwood. The trio creates a ravishing sound, captured with fidelity at Rainbow Studio in Oslo. Muthspiel has been praised by The Times of London for his “restless musical imagination”. Lyrical, grooving and atmospheric by turns, the guitarist’s compositions on Driftwood include tributes to his heroes Joe Zawinul and Michael Brecker. 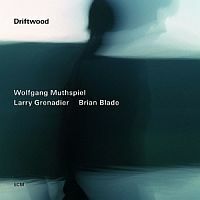 Released 2014.Austrian guitarist Wolfgang Muthspiel makes his ECM leader debut with Driftwood, a trio album of subtlety and depth featuring renowned US jazz players Larry Grenadier and Brian Blade. Muthspiel – who recently made his first ECM appearance on Travel Guide as a member of a cooperative trio with fellow guitarists Ralph Towner and Slava Grigoryan – has enjoyed long, productive musical friendships live and on record with both Grenadier and Blade, leading to a sense of telepathic interplay on Driftwood. The trio creates a ravishing sound, captured with fidelity at Rainbow Studio in Oslo. Muthspiel has been praised by The Times of London for his “restless musical imagination”. Lyrical, grooving and atmospheric by turns, the guitarist’s compositions on Driftwood include tributes to his heroes Joe Zawinul and Michael Brecker.